Heat the oven to 200°C (gas mark 7). Wash and dry the potatoes, then cut them in half lengthwise. Place in an oven-proof dish, season with 1/2 tsp sea salt flakes, a little sprinkle of black pepper and a good drizzle (about 2 tbsp) of olive oil. Mix well. Bake for 35-40 min or until well roasted, stirring every 15-20 minutes to ensure the potatoes roast evenly on all sides. Trim the ends of the asparagus and the snow peas, then use a small knife to cut them into bite-sized pieces. Blanch the asparagus and snow/garden peas for about 30 sec in a pot of boiling water, then remove from the heat and place the vegetables into a bath of really cold water. Drain well. In a small jar, combine the Dijon mustard, lemon juice, 1 tbsp olive oil, 1/4 tsp sea salt flakes and black pepper. Close the jar, then shake until well combined. 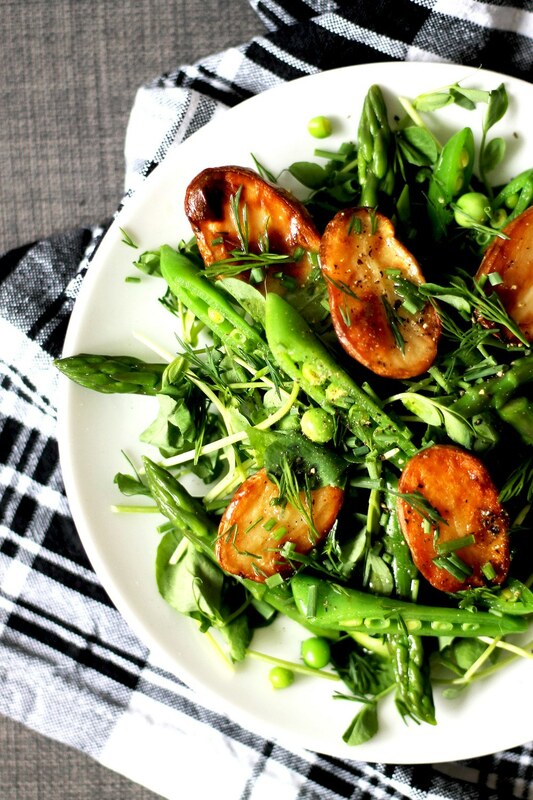 In a big salad bowl, layer the pea shoots, asparagus and peas. Dress with the lemon zest and lemony dressing. Mix well, then top with the potatoes and serve immediately.